Anyone any idea when we can expect this? I've been looking 2-3 times a day since the phone was released and still nothing. Have tried speaking with Google support about it who are completely and utterly useless! Just wonders if anyone has seen something I haven't about it. Is this the one that only protects the sides and not the back at all? No, its the one that protects ABSO-FREAKING-LUTELY NOTHING because it's still..almost a month after the phone's release...not available at Google Play. Yep that's the one lol! I was just wondering this myself. Maybe with a $35 price point, they just assume nobody's going to spend that much money on a case. I'd rather buy 3-4 other cases. The bumper on the Nexus 4 looked cool. The Nexus 5 case looks ugly. 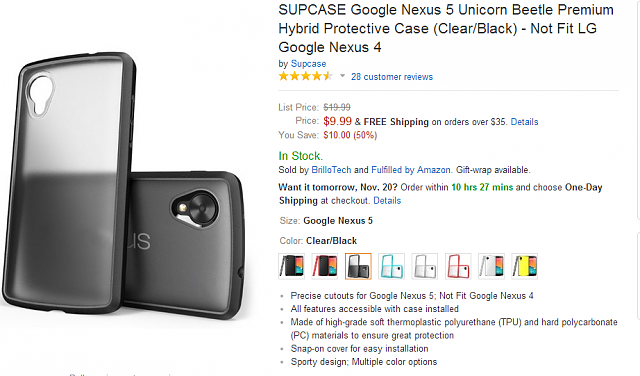 I wouldn't pay more than $6 shipped for the official Nexus 5 case, and that would be just to have it. Nice avatar, flick. I'm from Michigan. A bumper that only protects the sides, top, and bottom shouldn't cost more than $7, IMO. A much more useful and not much bulk adding case can be had for only slightly more. That's what I got and trust me, it add not much bulk at all and I can forget about the possibility of the back of my precious Nexus getting marred. I got the same one, but I'm not completely happy with it. It makes it hard to use slide in menus, especially Gmail and the Play Store. Oh, I'm less than elated with it myself. It's a bit hard to press the buttons. Have you noticed that? ...but it was $10 so I'll cut it a break. Yes, should I have gotten the Spigen Neo Hybrid? Of course. ...because I'm prolly gonna get it anyways. I haven't had any trouble with the buttons, but it makes holding the phone with one hand much less comfortable than no case. I've never really used a case on a phone before. That's funny. I've never used any smartphone WITHOUT a case (blackberry doesn't count, it's not really a smartphone. I didn't realize some of these cases weren't available yet. Is it a certain color that's the problem? I had ordered a gray one with my N5 on release day, and they both arrived together. I never actually opened the case, expected it to be an actual bumper case like the N4, but the N5's has a back. I actually went to process a return on it yesterday morning, and Google thoroughly impressed me, they are refunding me for the case and told me to just keep it. So now it's a backup in case for rough environments. I've got around 50 bucks play store credit that I'd gladly use if Google would allow me to use it towards accessory purchases but they don't. I ordered the Spigen slim armor and it should be here tomorrow. Anyone have any experience with it? The yellow and red just opened up on the play store. I was kind of interested in the red "Official" case, however it wasn't available when I ordered my Nexus 5. I went with a Diztronic Flexible TPU Case instead ($10 + shipping). If I were to order a case today I'd probably still take the Diztronic; $35 plus shipping just seems like a bit much. I just got the red bumper today it feels really great and it makes the phone so comfortable to hold. Got the red one today. It's a nice snug fit. As you'd expect, it makes the phone feel larger, particularly as it removes the rear curve of the phone. Still not sure what to make of the colour; it appears to be a sharp red on the play store, but it is closer to orange in real life. Still, I think it might be growing on me despite the initial disappointment. The material feels nice. Is it worth 25? Probably not, but I'm a sucker for official accessories. I received my yellow yesterday and it is definitely going back. I don't know what I was expecting but it just changed the feel of the phone (took away some of the curves and added bulk). The yellow is a bit of a different shade than online but close. The feel is ok but I prefer the phone naked. My Nexus 5 is back in the birthday suit! I ordered the black bumper case as soon as it went on sale a few days ago. Although it wasn't supposed to ship until next week, it shipped yesterday and is arriving sometime today. I also noticed this morning that the black and red bumper cases are now listed as "out of stock" on the Play Store. I was looking at this hard shell by LG...wonder if it would preserve the curve on the back. Google Nexus 5 - Who has a Meenova card reader, what case are you using?